Duquesa Village is an outstanding new development which is set back from the marina, beaches and restaurants, yet only a short 4/5 minute drive away. The development also overlooks the Robert Trent Jones designed, La Duquesa golf course. The apartments are set amidst landscaped gardens and floral walkways and there are 5 swimming pools and a paddle tennis court on site for you to enjoy. Our Ground/first floor apartment is finished and furnished to a very high standard and enjoys stunning sea and mountain views which can be appreciated from our large furnished terrace. The apartment complex has secure underground parking and 24 hour security. Even though Duquesa Village is very relaxed and in a peaceful location, a short drive or walk will take you to the many restaurants, bars and shops situated around the marina, where in the evening you can sample some excellent local cuisine or just sit and enjoy this wonderful location. Bathrooms are luxurious and all finished with marble floor and wall tiles, and high quality fittings. The en-suite to bedroom 1 has a jacuzzi bath, overhead shower, toilet, bidet and double wash basin. Bathroom 2 has shower cubicle, washbasin and toilet. The stunning and spacious lounge/dining area is finished in marble and furnished to a very high standard. There is a 32 inch LCD television and DVD player and the main terrace is accessed via the large patio doors. The kitchen is fully fitted with granite work-surfaces and appliances which include, oven, hob, fridge/freezer and dishwasher. There is plenty of storage space and crockery for use when eating in. Skiing in the Sierra Nevada is available from December-March and is a 2 hour drive away. The Costa del sol boasts some of the finest courses in Europe. Overlooking Duquesa Village is the Robert Trent Jones designed La Duquesa Golf where you can enjoy 18 holes and afterward relax in the clubhouse for that well earned Drink. The course also boasts a driving range and putting green. Top class courses such as Finca Corstein which will host the World Matchplay Championship in 2009,Valdarama and San Roque are within 10/15 minutes drive, these are only a few of the many available on this coast, only a short drive in the direction of Puerto Banus and Marbella will bring you to great courses such as Los Flamingos, La Quinta and Rio Real. You will really be spoiled for choice. 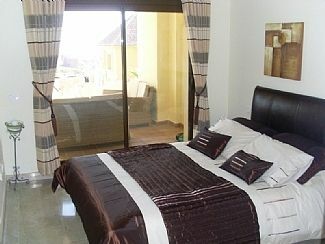 Just returned from this apartment on La Duquesa Village. Beautiful apartment and a very pretty well maintained complex. Will definitely go back again. The apartment was true to the listed details regarding layout and facilities and was immaculately clean and well equipped. The kitchen boasted plenty of crockery and cutlery and we were able to dine outside, sitting on the relaxing patio table outside and then relax on the settee too! The apartment provided a good base for our stay, we have in the past been used to staying on the beach front in Duquesa so this was a change for us, however it did force us to go and try a variety of beaches all within a short drive and we enjoyed the change. The pools were clean and tidy and the 'Village' took receipt of a number of new sun loungers whilst we were there, which meant no fighting for a sun bed - Heaven! We were met in the port by the 'stand in service' manager who was very helpful, this meant that we just had to follow him to the Village - this beats following directions any day! I would certainly recommend this apartment to my friends and relatives, despite the hillside location (car is essential), the apartment was easily on par with those we have stayed at in Los Granados. The owner was helpful through out and quickly answered any questions that I had prior to the visit. las estancias del apartamento son muy amplias y cómodas, gran terraza, la urbanización muy bonita, con estupendas piscinas.Hay que coger coche para todo, también para compras, cerca no hay ninguna tienda para alimento.Se puede bajar al puerto de la Duquesa y a la playa andando dando un agradable paseo, pero para volver gran subida, posibilidad de coger un taxi (aprox 7 u 8 euros) para subir.En general bonito y muy tranquilo, muy ventilado, bonitas vistas, muy relajante, montaña y mar, bastante cerca del pueblo de Manilva. Temperatura perfecta, no hacía falta poner aire acondicionado. Cosas que hemos echado en falta: no había canales de TV en español,sólo en Inglés y muy, muy escasos,(informativos).El menaje para cocinar bastante deteriorado sobre todo las sartenes, y no había cacerolas por ejemplo para cocer pasta, no hay Wifi, luz excesivamente tenue en la terraza para cenar por la noche. The beach and marina are only a short 5 minute drive from the apartment and can be reached on foot, however a car is recommended. Around the Marina and beach there is free parking and sun beds and parasols can be rented for the standard rate. There are also many beach bars dotted along the long stretches of coastline. Water sports and pedaloes are also available. Malaga Airport is 50 minutes driving distance. Gibraltar is 25 minutes away and is serviced by Monarch Airlines. The road access from Malaga is excellent and is motorway most of the way, a small charge is payable as this is a toll road. Car hire is recommended but taxi's are also available from both airports. The marina and beach are only 4/5 minutes drive away and parking in and around the marina is free. Estapona is a 10/15 minute drive away. Puerto Banus is a 20 minute drive away. There are some lovely inland villages - Casares being only 10/15 minutes drive away and Benhavis with its many wonderful restaurants 20 minutes drive. Close to Duquesa marina is the town of Sabinillas, popular with the locals,and has shops, supermarkets, banks and a promenade offering many cafes and restaurants. Also close by is the millionaires boating playground of Sotogrande, Or head into Puerto Banus with its super yachts and super cars. Booking Notes: A 25% deposit is required to secure the booking. A booking will be held for 3 days while you arrange flights etc. A security deposit of £150 is required and will be returned to you once the apartment has been checked after or on the day of departure. Full payment will be due 6/8 weeks before departure Changeover Day: We will try to be as flexible as possible on arrival and departure times, but this may sometimes prove difficult in high season. Arrival would be after 2.00pm and departure by midday to allow for cleaning. These times will depend on availability. Notes on prices: Prices are for the property per week in UK Pounds. All durations are accepted and a price can be quoted on each individual stay eg 10/11 nights.